This is a promotion to attract new and current loyal customers to sign up for redONE Postpaid Family line with no deposit required for the Family line. When can I subscribe to the Family line? This promotion will begin from 1 February 2019 until 31 December 2019. You can sign up at any redONE Branch and Partner Shops near you. Who can sign up for the Family line? What are the plans eligible for the Family line? How many Family lines can I sign up for under this promotion? Eligible Master line customers can add one (1) Family line. This line will be a supplementary line under your Master account. Yes. You will need to pay RM10 registration fee per line. Is there any deposit required for this promotion? For higher credit limit, the standard deposit is applicable. Yes, this promotion is subject to a contract period of 6 months. I already have three (3) supplementary lines. Am I eligible for this promotion? If you are an eligible Master line customer, you can sign up for one (1) new Family line with no deposit under this promotion from 1st February 2019 onwards. Can I port-in my line from another operator to register as the Family line? Yes, you can. The MNP line will be registered as a Supplementary line under your Master account. After I take up this promotion, am I allowed to change my plan? Yes. You are allowed to change to any standard plans. However, if you are still under contract, you will be charged an early termination penalty should you change to a lower price commitment plan. Will I get a separate billing under this plan? No. Bill for your Family line will be consolidated in the same bill as your Master plan. As a foreigner, can I subscribe to the Family line? Can I terminate my Family line? Yes, as long as your Family line is not tied to any active contract upon termination. Otherwise, the penalty charges will be applied accordingly. The Family Programme will run from 1 February 2019 to 31 December 2019 (both dates inclusive). The promo is open to all new MNP port-in Master line, existing MNP ported-in Master line and existing redONE Master line (non MNP) customers with more than 3 months tenure to add one (1) new line. 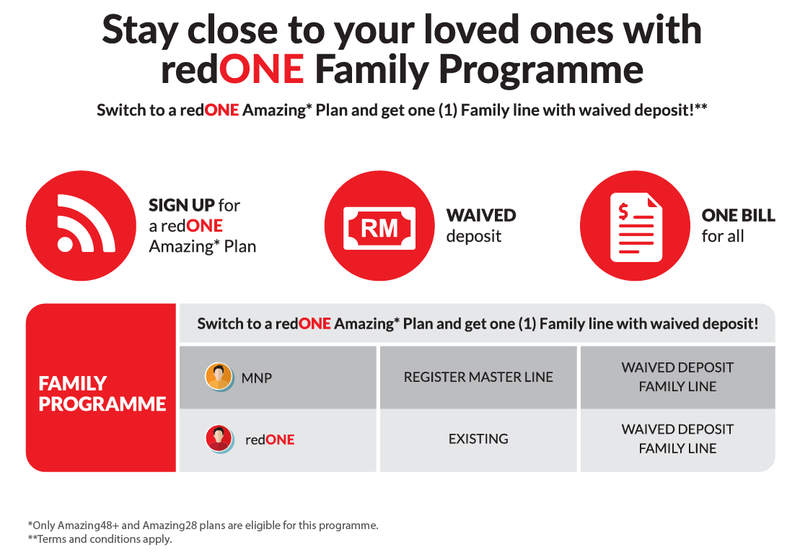 The Master line customers must register the Family line on an Amazing28 plan with RM50 credit limit or Amazing48+ plan with RM100 credit limit. In the event the user requires a higher credit limit, then standard deposit is required as per normal procedure. Foreigners, Corporate lines and M2M lines are not eligible for this offer. Only consumer individual lines are eligible for this promo. The current Master line or Supplementary line must be in active mode. Any form of suspension or barring is not allowed. The Family Programme line must be registered under the eligible Master line. If customer already has additional lines, they can still apply for one (1) more new line with no deposit under the Family Programme.